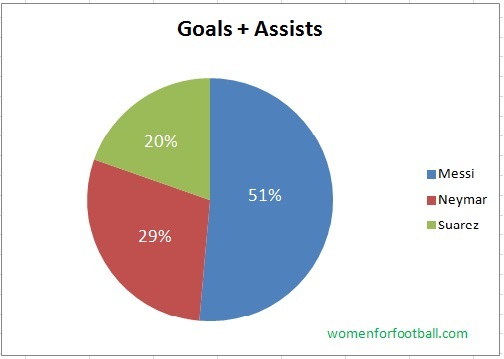 womenforfootball.com – 2014-2015 Season has been a rough one for Barcelona so far. Half way through the season and they are not leading the table as they used to. In fact, they are outpaced by their fiercest rival, Real Madrid, and are trailing Los Blancos by 2 points so far. And Athletico Madrid is not too far away to catch Barcelona with 5 points fewer than them. Despite all that, all three strikers of Barcelona- Messi, Neymar and Suarez- are in top form, scoring goals almost in each game, and providing numerous assists to others. As witnessed throughout the recent games, Luis Suarez has slowly reached his top form at Barcelona too. Considering all three strikers’ fantastic performances so far, I always wondered which one is doing better than the other two this season. So the question is, which of the three strikers leads the other two in terms of goals and assists? And between them how many goals and assists are exchanged? To answer these questions, I pulled out data from Barcelona’s 2014-2015 season so far, in addition to their Cup games and UEFA Champions League games and counted each of Messi, Neymar and Suarez’s goal and Assist tally. As per chart below, Messi is the leading goal scorer and also assist provider compared to his counterparts, Neymar and Suarez. Messi has netted 39 goals and has provided 16 assists to his team mates so far into the season. Neymar is 2nd best striker of Barcelona with 27 goals and 4 assists. Suarez is technically 3rd with 10 goals and 11 assists so far. 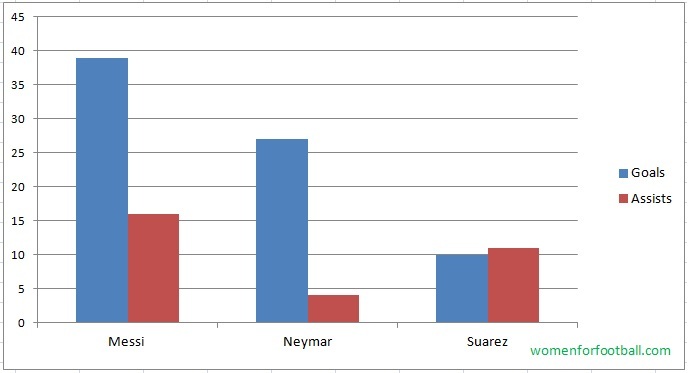 However, interestingly, Suarez’s number of Assists has outpaced Neymar’s so far. Incredibly, the three strikers have scored 76 goals and provided 31 assists so far for Barcelona this season. In that sense, to see which of the three has highest impact, here is a pie-chart that shows each of the striker’s tally of goals and assists as percentage of total goals and assists of the three strikers. As shown in the pie-chart below, Messi is still carrying the burden of the team with 51% impact, Neymar has 29% impact and Suarez has 20% impact. Of course as mentioned, these data include domestic league games, Cup games and UEFA Champions League games. It would be interesting to witness how these stats will change by end of the season. Considering the controversial spat between Barcelona’s new coach, Luis Enrique with Lionel Messi off the pitch and rumors of Messi leaving Barcelona next season, this data perhaps convinces Luis Enrique that losing Messi would have huge impact on his team’s scoring sheet; With these stats, that would potentially result in 51% reduction in number of goals and assists in Barcelona’s games. Also, these stats, shows Luis Suarez’s improving record in Barcelona’s front line and it would be interesting to see if he will catch Neymar’s record by the end of season or not. ← Chart: Who deserve 2014 FIFA Ballon d’Or: Messi, Ronaldo or Neur?